Each of Canela Lemoine's hand-formed bands can be personalized with the names of those you love most. Or is it the other way around? Whether they're across the country or just down the hall, keep your lovable brood close at hand with this customizable spinner ring. 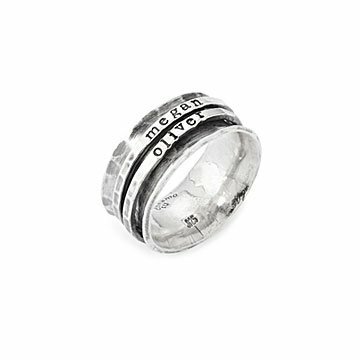 Each of the hand-formed, sterling silver bands can be personalized with up to ten characters—just right for holding the names of those you love most near. Handmade by Canela Lemoine in California. Clean with gentle dish soap and a soft cloth, polish with a soft polishing cloth. Wife loved it. Personal, well crafted. Not in any store. Great way to give a unique and personal gift! This design worked out great because my wife is a "fidgeter" , so the spinner theme keeps her from picking her fingers. Dissapointing - not at all like the photo. The ring is not true to size, has rough edges and the spinner dimensions are not equivalent to the photo.